Adrian Stannard [Waltham Forest Civic Society] provides us with a window on the Council Grotto, determined as ever to serve us with the lowest common denominator fare, no matter how inappropriate or unsound. The Cabinet split along party lines this evening when the Liberals declined to support this report (attached) . The vote 6 Labour to 4 Liberals meant the report was passed and the council will look for a developer for the Arcade site which will include a swimming pool and cinema. 1. A feasibility study was needed and a full financial appraisal before the proposals are progressed any further. 2. A feasibility study is needed inorder to assess whether the provision of a swimming pool/leisure centre would fulfil the role of an "anchor" tenant. 3. Any decisions concerning the Arcade site should be delayed until the current contractural agreement with St Modwen's has expired and the conclusions of the Healthy Living Hub exercise are reported to Cabinet in January 2010. Cllr Sullivan, Chair of Scrutiny, said the council was heading for massive deficits and the Arcade proposals were unaffordable and "damn reckless". Cllr Wheeler said these points were covered in his report and it was easy to find reasons not to proceed. "We know we have a package that will work". Financial arrangements will work but are "novel". It was necessary to move on otherwise the opportunity is lost. Cllr Macklin was concerned at the interweaving of the Arcade site and the Pool & Track, whereas sports provision needed to be improved. Work should stop on the Arcade site plans and the council should focus on the other major issues that are looming. Taking the pool away still leaves the track to be managed. Those in the public gallery gave a resounding support to Cllr Macklin's speech but were silent at the end of Cllr Wheeler. There have been an unfeasable number of feasability studies done so far, and yet so much of what has reached the planning stage has been utter tosh. 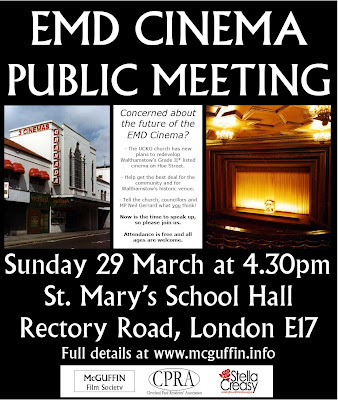 It is time to take a step back, ignore the political / election driven imperatives to be seen to be doing something, anything, it doesn't matter what it is, and reconsider the vision for the whole town centre, including the EMD cinema. ................…St Modwen and the Arcade site scheme”. It’s not all hard slog and protesting for Fight The Height’s foot soldiers. On Sunday 13th September at The Rose and Crown in Hoe Street their hard work was handsomely recognised. 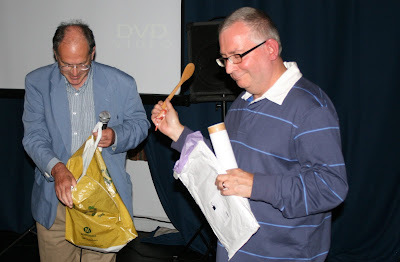 In front of an enthusiastic audience, FTH received a special commendation from Capacities Ltd for its ongoing Arcade Site campaign and on hand to receive a framed certificate and a wooden spoon was the group’s secretary, Barry Coidan. The award ceremony was part of the first Ceausescu Awards run by Capacities Ltd, an educational agency promoting better participation of citizen in the design and management of city amenities. These “bad building prizes” are named after a remark made by Boris Johnson during his 2008 Mayoral campaign in which he accused his opponent of encouraging “Ceausescu – like projects”. Steve Butters, the agency’s director, addressed the audience for a few minutes to explain the agency’s aim and why Waltham Forest Council’s Arcade site scheme would have made Nicolae and Elena proud. Other shortlisted projects, characterised by oppressive scale, bulldozed planning and architectural hype, included the Peninsula Square in Greenwich, Dalston Square in Hackney, the Aldgate Union Tower in Tower Hamlets and Newham’s Queens Market at Upton Park. Dalston Square won the golden spoon award with Queens Market scooping the silver spoon. And the fight goes on. Our Council is still pursuing a major development on the Arcade site which would include a substantial tower – albeit financed by the Council Tax payers rather than private speculators. 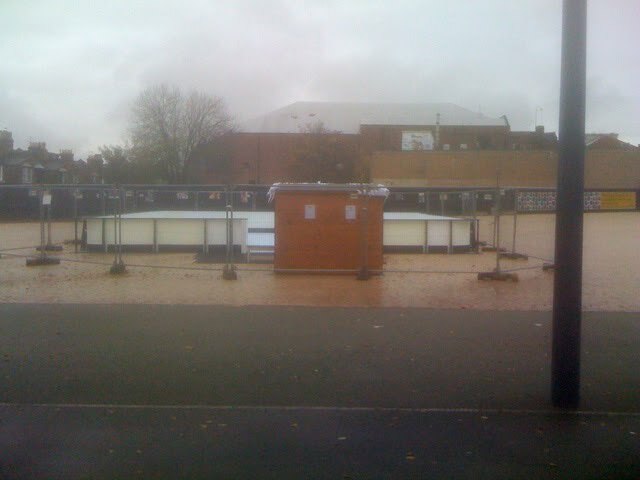 The Arcade site is now paved over: the Council belatedly seeking our views on what should fill the temporary open space. 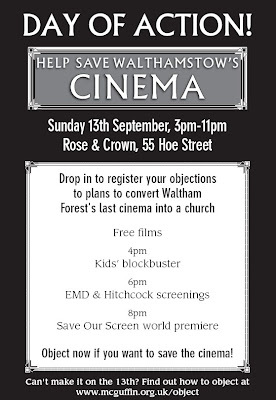 Anyone at the Day of Action in support of the EMD Cinema at the Rose and Crown would have seen the huge response to Fight The Height’s postcard project offering alternative uses for the Arcade site. We’ll happily share Waltham Forest’s residents’ ideas with our Council – if they have a big enough post bag! If you’re intrigued by the Ceausescu awards and/or Capacities Ltd you can contact them at capacities@smithfield.co.uk. St Modwen Give Back Handers? that St Modwen, those fine, upstanding, members of the urban development community, protectors of architectural heritage, and bastions of sustainable living, offered bribes to those Phoenix Four scallywags. I am sure that when a thorough investigation is done, the reputation of those excellent St Modwen chaps will remain. We're teaming up with McGuffins to draft ideas for objections. We'll post them here soon. The deadline for objections is Monday 14th September. Neither the UCKG church or the Council have seen fit to make the planning application available online. So here it is - see the zillions of links below! We'll post details of how to object to the plans ASAP. Our exciting exhibition of ideas for the Arcade site will be at the Changing Room Gallery, Lloyd Park (31 August - 6 September), and as part of the E17 Art Trail at the Rose & Crown pub on Hoe Street (5-13 September). 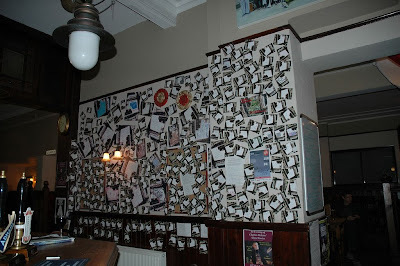 So please grab a postcard*, fill it in and send it to us to arrive by next Friday, the 28th. Thanks! * You can pick up a postcard from venues including: Ye Olde Rose & Crown Theatre Pub, Waterstones, The Mall information point, Co-operative Bank, Daisy's, Sainsbury's, L'Hirondelle, Second Nature, Hornbeam, Caliente, Penny Fielding's Beautiful Interiors. Or download one from the "We want YOUR ideas on a postcard!" story below. Or email your details asap to mail@fighttheheight.co.uk and we can send you a postcard. Follow the link below to the Councils Consultation Questionnaire. If you want a car park, a pig farm, or a 1 : 2.6 scale model of Uluru then make sure you let the council know. Otherwise we'll have a couple of crummy old fair ground rides, and some new seats for the open-air-drinking club for the next 2 years. Summarising a year of "catastrophic" write downs, Bill Oliver, St Modwen's chief executive admitted "we are at the lowest ebb, [but] we don't think we've reached the bottom." "with the property market likely to stay moribund for some time, it is hard to get excited about the prospects for the sector"
An appropriate comment also in relation to the 'car park' which the council have built for us. I am finding it very hard to get excited about the prospects for this sector. However, the Grand Opening is coming up, and it will be fun. A bouncy castle, face painting and some jugglers in a car park. Yet again Waltham Forest Council striving to get the very best for Walthamstow. We want YOUR ideas on a postcard! What would YOU like to see on the Arcade site in central Walthamstow? We're asking residents, artists, schoolchildren and architects to send us a postcard with their dreams, visions and ideas for the site, on the corner of High Street and Hoe Street. Thousands of postcards are being distributed. 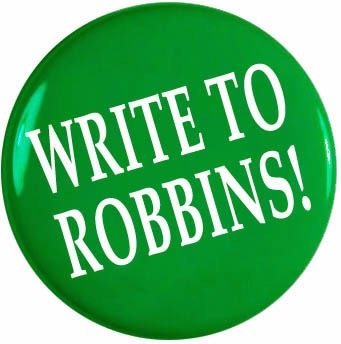 Grab one at a pub, shop or community centre near you and jot down your ideas. Alternatively, click on the links below to download the postcard, download a bigger picture to work on (entries can be in any form, not just postcards), or download a brief for schools or architects. You can pick up a postcard from venues including: Ye Olde Rose & Crown Theatre Pub, Waterstones, The Mall information point, Co-operative Bank, Daisy's, Penny Fielding's Beautiful Interiors. Or email your details to mail@fighttheheight.co.uk and we can send you a postcard. We'll be exhibiting entries over the coming months. Our first two exhibitions will be at the Changing Room Gallery, Lloyd Park (31 August - 6 September), and as part of the E17 Art Trail at the Rose & Crown pub on Hoe Street (5-13 September). Details of more exhibitions to come. Having been rejected by Hackney Council in 2007 and again by the Secretary of State, following a Planning Inspectorate enquiry, in 2008, the developers have resubmitted plans for the development of the former Lesney Matchbox Works on the River Lea Navigation Canal and Homerton Road. It consists of a 15 storey tower block and two other builds of 12 and 10 storeys. The Planning Inspectorate report found nothing wrong with the design, bulk or height of the proposed build – rather he said that “In terms solely of design, this could be a development of which the Borough would be proud. ....and would be attractive to behold and would excite and delight.” The SoS’s rejection was because of the housing mix of the proposed development not the height and bulk of the tower blocks. So why should FtH be interested to this development – which is not in our borough and miles away from the Arcade? The worrying thing is that Hackney Council refused planning permission on the grounds that a tower building would be inappropriate. Yet the Planning Inspectorate found in favour, and praised the design. Ironic since that the proposed tower is only ½ mile away from where the local council tower blocks were blown up 20 years ago – to be replaced by low rise housing. The Lea Navigation Canal running towards the Limehouse Basin is overwhelmed by high rise, massive developments. They are eyes sores. But somehow, planners don’t get it. They have to meet the dwelling density targets and developers have to jack up their profits. The result is a design famine which is devastating in its effects on the neighbourhood and people sense of place. And, of course, the Lesney development is a “landmark” project. Under that label, any design can be shoe horned in; no matter how inappropriate. Even with a sympathetic Council, large tower block schemes are being approved. 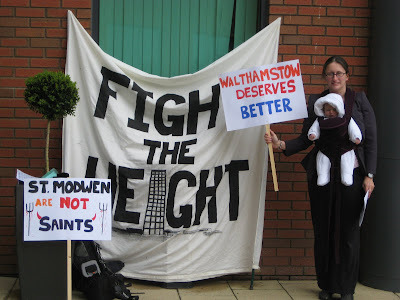 What’s clear is that the local and wider community has to make it voice heard if we’re to get something in Walthamstow that is not a planning and community disaster. A council regeneration officer has finally clarified what is happening with the Arcade site's temporary use. The design has basically been decided on, and any public consultation will simply be about what uses the resulting triangle of blank space will be put to (see drawing below). 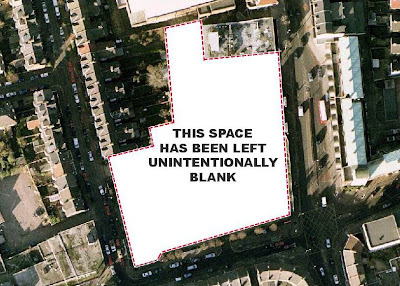 "Council Officers have investigated alternative surfaces for the Arcade site with the objective of enabling the maximum number of potential temporary uses on the site. As the site may only be in temporary use for 18 months to 2 years the Council is seeking to use the most economical materials and, where possible, those which can be re-used elsewhere once work begins on the long-term project. 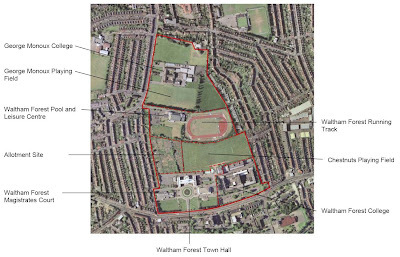 Soft landscaping would be very expensive if it were to be undertaken to the standard which Walthamstow Town Centre deserves and it would not enable the variety of interim uses the Council would like to offer the community. The existing town square and gardens are in close proximity to the site. 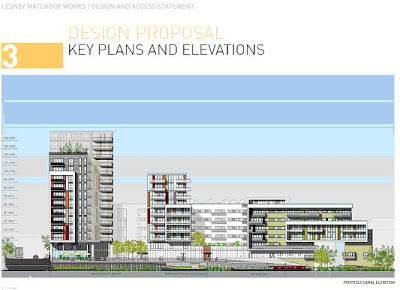 "The consultation with the public will be on uses for the site and not the design of the site. There will be planters on the site to add foilage and colour to the scheme. There could be a play facility on the site as it is possible to lay a temporary safety surface." They have announced a public consultation on what the temporary use of the Arcade should be. Pox pops in this week's WFM magazine all say it should be a park. And yet the council has already filed a planning application to cover a big triangular section of the site with a hard surface, prior to consultation, but pretty much precluding any possibility of it being a park. Not got time to see the planning application yourself? 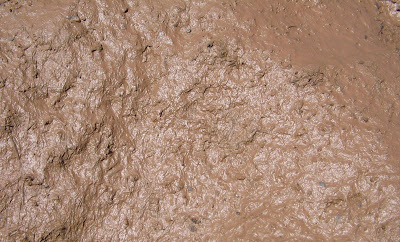 Click on the picture above to see for yourself. The good news is they're ruling out car parking. 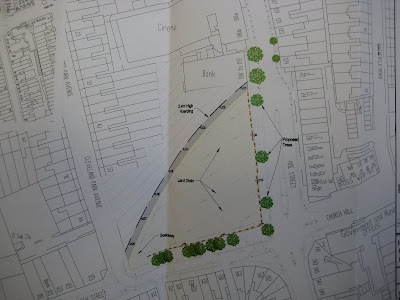 The triangle of land, with a couple of trees reinstated on Hoe Street near the bus stops, will back onto a 2.4m high hoarding that fences off the wasteground behind houses on Cleveland Park Avenue. 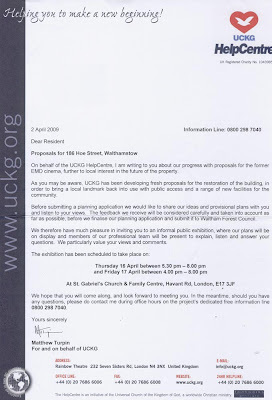 If you want to object, the application is number 2009/0669/LA and you can send objections to Development Management Group, LBWF, Sycamore House, Forest Road, London E17 4JF by 29 June 2009. Over 300 people turned out on Sunday at a public meeting in support of the EMD. It was good natured and informative event. Time and again members of the local community spoke passionately about the value of the EMD to Walthamstow as a cinema, and their fears about any scheme in which the UCKG proposed to share a small portion of it. Councillor Macklin's forthright condemnation of the Council's decisions throughout the EMD and Arcade saga, followed by the recollection [by other people] that he was party to those decisions and didn't ever oppose them. 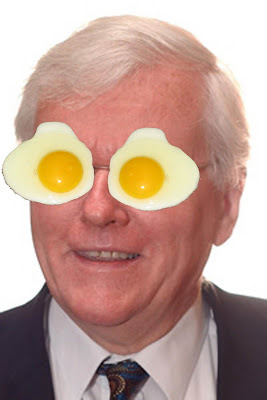 Councillor Wheeler's rambling riposte, in which he appeared to support pretty much everyone, especially if they want a swimming pool in the town centre and a running track in the sky above it. Barmy £35m plan for Arcade site... please send a quick email TODAY! The council's latest barmy decision is to plough £35m of public money into a new Arcade scheme including a swimming pool. See this story in the Walthamstow Guardian... including many comments from frustrated residents! While we prefer a pool to a Primark, the decision to stick with developer St Modwen means the unpopular tower block design will probably change very little. Especially as the council seeks to recoup its (read: our) money by flogging off flats. The council's even going to fund St Modwen to the tune of £500,000 to develop the plans. So yet again tonnes of money are being poured into a scheme in which the developer can't lose - but we, the public, will lose out no matter whether the plans go ahead or not. 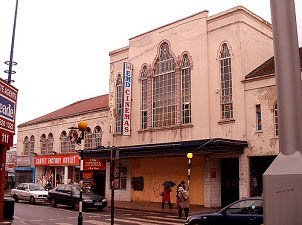 Also the council finding £35m to bail out its tower block plans undermines its claims that it can't find the monet to help save the EMD cinema. We think the council should instead genuinely go back to the drawing board, without being tied to a developer, genuinely consult residents about what we want, and consider the fates of the Arcade site and the EMD together. Anyway, the council cabinet made the decision last night to go ahead with this barmy plan, but was split along party lines. If four local councillors insist on it, the decision can be called in to full council next week for debate - and that would see a good chance of it being overturned. Or any five local councillors could ask the mayor to call an extraordinary council meeting. Both of these options could see the decision sent back to cabinet for reconsideration. So... please fire off a quick email TODAY to your local councillors - visit this council web page to find out who they are - simply asking them to please call the Arcade site decision in to full council. This will be particularly effective if your councillors are either Lib Dem or Conservative (the Labour guys were in favour of the plan). Oh and please do email your councillors. Don't just assume someone else's councillors will do the job! These guys care about votes - so the more emails they receive, the more chance of them calling it in, and the more chance of the decision being overturned. Our concern major concern is that they still hope to recoup 30-40% (i.e. £10-14m) of the budget through the residential units, and if so then - you guessed it - we're talking another unpopular tower block plan!